The $10 Flea Market Challenge. 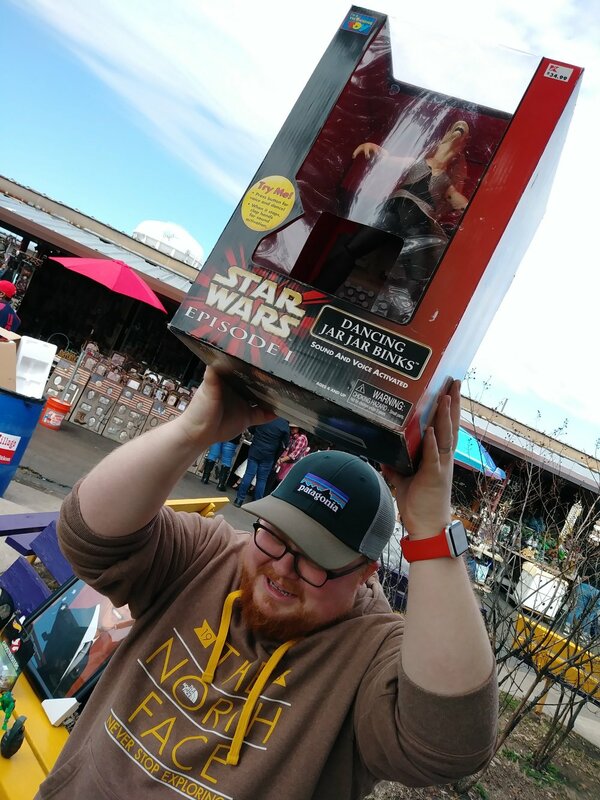 We traveled to the largest flea market in Texas, Traders Village, to see who could find the best bang for their buck. Though we all put up our best efforts only one could be crowned king. Chris found a Ghostbusters Hot Wheel Ecto I and II combo pack, Andy grabbed a TMNT bootleg Donatello and oddly dressed Slash from the original line, Doug was taken by a large beautiful portrait of Obama, Reuber snagged a wicker trucker hat with built in bottle opener, Brims got himself a decommissioned grenade, Samuel found a stunning shirt that has to be seen to be appreciated but the winner was Mazur with a hell of a find seen below. A mint-in-box Dancing Jar-Jar Binks from The Phantom Menace. Way to go Josh! Now you're stuck with that! Posted on March 13, 2018 by Reservoir Geeks and tagged challenge fleamarket.